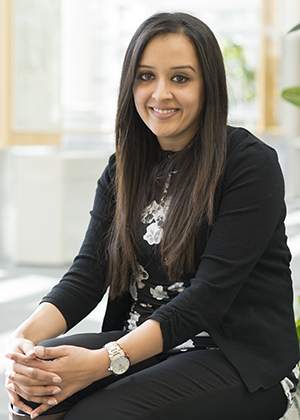 Komal began her nursing career at William Osler Health System in Brampton, Ontario in 2006 on an in-patient oncology unit where she had the opportunity to provide direct patient care, precept nursing students, mentor nurses, and educate healthcare professionals throughout the organization. Komal values lifelong learning and has demonstrated this in many professional activities she has engaged in including a position as chair of the Oncology Interprofessional Unit Base Council and the William Osler Oncology Journal Club. In 2011, Komal completed an RNAO clinical fellowship that focused on oncology and palliative pain and symptom management. Komal joined de Souza Institute as an Advanced Practice Nurse Educator in 2012. While working at de Souza Institute full-time, she continues to work at Brampton Civic on a casual basis. Komal holds a BScN from the University of Windsor and has completed her Masters in Nursing with a teaching focus from Athabasca University. She obtained her Oncology CNA certification in 2010, Hospice Palliative Care CNA certification in 2012 and CVAA certification in 2014. Komal is also one of the first de Souza APNs in Ontario.